Good news! SSD Opal gave birth to her puppies on October 29. She has six healthy yellow lab pups. These puppies are known as Owen’s Litter, named after a young boy, Owen Brezitski, who passed away in 2011 after he was struck by a distracted driver. 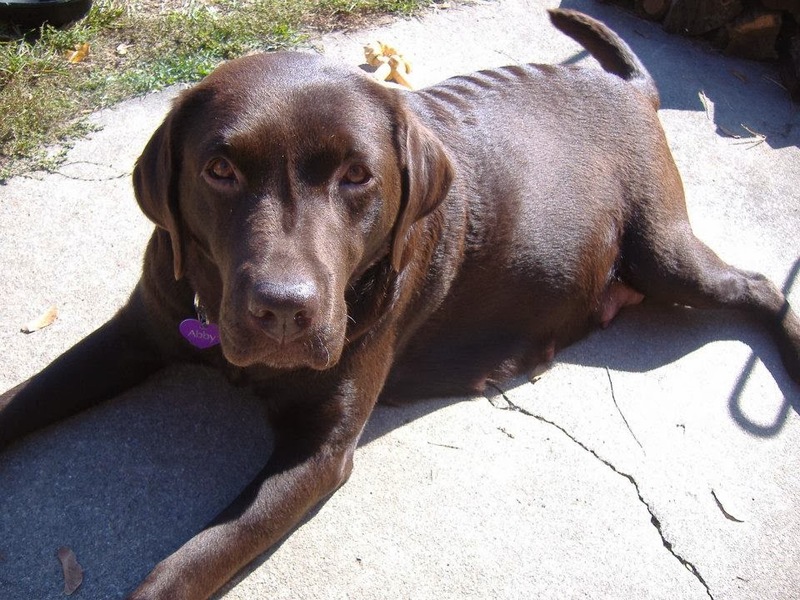 His family started a foundation in his name, and they chose the names of Opal’s puppies. All of the puppies have names that start with the letter O.
Opal gave birth to one puppy who was stillborn. His name was Ozzy, and he will be buried in a special spot at the home of one of our volunteers. We will have more photos of each of the puppies soon. Meet SSD Lexington! Lexi is from KSDS, Inc. Assistance Dogs in Kansas. Our wonderful volunteer Robin drove down to Kansas to pick her up. Thank you, Robin! 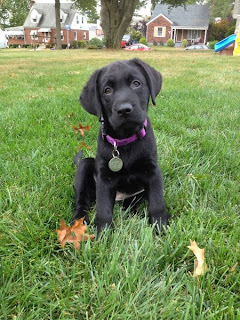 Lexi is a black female Labrador Retriever, and her story is a little bit different than the other puppies we’ve received from other service dog organizations. Her story is different because she’s part of the new Assistance Dogs International North America Breeding Cooperative (ABC). We’re very excited to be part of ABC. It’s a dream come true! ABC will allow us and the other member organizations to improve the quality of our service dogs, strengthen and diversify the genetic lines, and create a reliable supply of puppies that are suitable for assistance dog work. ABC is a vision of Bob and Marina Phillips, and the Assistance Dogs International North America Region Board recently approved it. (You may remember that back in February, we invited breeding consultant Marina Hall Phillips to evaluate our program so we can make improvements.) Smaller ADI members are going to really benefit from this co-op arrangement. It means that we’ll always have puppies. This is important because despite the many litters we’ve had recently, there have been times when we have had very few puppies in our program—which mean that we were placing fewer service dogs at that time. A steady supply of puppies means that we won’t need to worry about whether we’ll have enough service dogs to meet people’s needs. So what is ABC exactly? It’s a cooperative breeding program based on the concept of group breeding. Members assign their best broods and studs to the co-op. A certain number of the puppies will stay with the organization that whelps the litter, and the other puppies will be distributed to the other members of the co-op. This group breeding method vastly improves the dogs’ genetics, which ultimately means that our service dogs will be of even higher quality. As you know, we just received SSD Lexi through ABC. We have also entered SSD Opal into ABC for her next litter, which is due at the end of October. She’s expecting 3-5 puppies. Approximately 50% of her litter will stay with us and the rest will be distributed to ABC members. SSD Meade is the stud we have chosen to enter the program. We are a Host Member of ABC, which means that we will be hosting one or more breeding dogs that have been assigned to ABC. Right now, we are hosting Abby from Pacific Assistance Dogs Society. Abby was bred to PADS Buffet (who is also the father of our own Ice Cream Litter), and she will give birth at the home of one of our breeder caretakers. Some of her puppies will then stay with us. Abby recently flew from to Pennsylvania with our training coordinator, Amanda, and our puppy coordinator, Becky. She was an amazing traveler! She fit under Becky’s seat on both planes and mastered trains, shuttles, buses, vans, and lots of walking. After her puppies are eight weeks old, she will return home to PADS and her caretaker, who already misses her. We’re very excited about the breeding cooperative and how it will improve the quality of service dogs in our program! SSD Irwin has found a new home with Ryan, one of our trainers. As sometimes happens, the life situation of Irwin’s puppy raisers changed and they were no longer able to take care of him. His routine is a little different now, but he has done very well adjusting to his new home. Irwin helped Ryan get ready for a 5K race at the beginning of October. They ran about four miles together every other day. “He’s a great runner and will actually pace himself with you as you run,” said Ryan. If you’ve been following Irwin, you know that he went almost everywhere with his puppy raisers. He has continued to go out in public frequently. He’s gone to the grocery store, multiple restaurants, and of course, Petco. Irwin goes to work with Ryan, which means Irwin has been getting a taste of kennel life. He seems to be enjoying his time at the kennel and play with the other dogs. Overall, Irwin has done quite well adjusting to his new home—which is exactly what we would hope for and expect from a service dog in training. Service dogs need to be able to go almost anywhere with their partner, and that means that the dog needs to be confident about going into potentially scary situations. (Scary for a dog, that is.) A dog could exhibit fear in a variety of situations. How do you train a dog to not be afraid? At Susquehanna Service Dogs, we used to have a saying: “Remember the back door and keep your dog safe.” This “back door” is your escape route if your dog is looking or acting fearful. Some fears are small and don’t necessarily require you to use back door and leave. 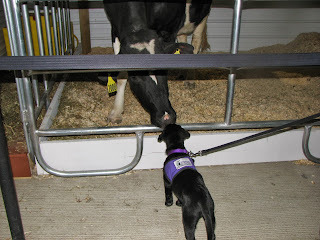 Let’s say that you and your dog are visiting a farm. Your dog sees a cow and starts to act fearful, maybe even barking a little bit. You can let your dog know that it’s okay and there’s no reason to fear the cow by using treats. Give your dog a treat for looking at the cow (and not barking). The dog should learn to associate the cow with treats, and they will see that there’s nothing to fear. Then the next time they see a cow, give them treats as soon as they look at it. This method works well for small fears in the environment. But what do you do when your dog has bigger fears or they’re still afraid of the same thing the third time they’ve encountered it? If your dog sees another dog or a person who looks scary to them, and starts acting terrified, your best option is to leave and not return. Why is it a good idea to take the back door and leave in this situation? Every time your dog experiences extreme worry and starts barking or growling, that barking and growling is releasing adrenaline, which makes the dog feel better and rewards the dog each time for this aggressive behavior. Each time the dog barks or growls with this adrenaline rush reward, the behavior becomes stronger. This means that it’s harder and maybe even impossible to remove the aggression with absolute security. By leaving, you prevent your dog from being rewarded for barking at the scary dog or person. If they’re not rewarded with that adrenaline rush, it will be easier the next time the dogs sees that scary dog or person. Now, sometimes dogs are afraid of objects, like an elevator. If this is the case, just stop riding elevators for a while, especially if you have a puppy. It’s possible that the puppy may be going through a fear period which they will outgrow. Once the puppy has matured a bit, you can try taking an elevator again. (If you have an SSD dog, make sure you’ve talked to a trainer about the proper way for service dogs to enter and exit an elevator.) When you do return to the elevator, make sure you have lots of yummy power treats with you and only plan on riding the elevator once. Sometimes this will end the fear and the dog will be recovered. However, be careful not to try different elevators while your dog is fearful of them. You don’t want to create a generalized fear of elevators. When it’s time to introduce a dog to a situation, place, object, person, or animal that caused the initial fearfulness, try to set it up in the best possible situation. If your dog is meeting another dog, follow appropriate dog greeting procedure and make sure that the other dog is sweet, nice, and never a threat to other dogs. Always start with something easy and avoid challenging situations. And remember, if your dog still shows fear, do not press the point. Take the back door and leave. What happens if your dog shows fear and worry, and you don’t have the choice to leave? Just pick the safest option for you and your dog. For example, if your dog is afraid of the vet’s office, just try to get your dog inside and use lots of treats. Sometime when you don’t have an appointment, go back to the vet and just sit in the car and give your dog lots of treats. When your dog is okay with that, try going inside, give them lots of treats, and leave. But if you have an appointment, just take the easiest, fastest, and safest way possible to get your dog inside, so the experience is over as soon as possible. If you take your dog somewhere and your dog becomes fearful of a location that that you must go through in order to leave, use the same method that you would with the vet. Use lots of treats and even lure your dog with the treats. Get through the fearful location as quickly as possible so you don’t increase the length of time your dog is anxious. Don’t worry about clicking. Just give your dog treats. Then the next time you need to go to this location, make sure you have another plan in place in case your dog still exhibits fear. Remember, keep your dog safe and use that back door. When in doubt, be safe and leave. Don’t practice over and over hoping to acclimate your dog to the thing they fear. You will most likely just end up making your dog even more fearful, and that fear will become cemented. Don’t be afraid to ask for advice and find a new approach. And never net your dog practice aggressive, fear-based behavior. Every time you let your dog act aggressively, they are reinforced for the aggression. There are many other ways to deal with fear. There is Constructional Aggression Treatment (CAT), Behavior Adjustment Training (BAT), the “look at that game,” and of course, classical conditioning. If you have an SSD dog, please call a trainer for advice. Did you know that we have a puppy raising program in northeast Pennsylvania? We do! We have a great group of volunteers who meet on Wednesdays in Bear Creek. Right now there are six dogs in this branch: Brutus, Sandler, Roo, Ripple, Carbon, and Freckle. Last week, some of our staff and volunteers drove up to visit the Northeast group during their puppy class. Their puppy classes are run a little differently than our puppy classes in Harrisburg. Each dog and puppy raiser work on something different, based on where that dog is in its training. SSD Freckle worked on nail clipping. SSD Carbon worked on leave it. Look at the pile of treats he ignored. SSD Roo worked on targeting—touching her nose to a piece of duct tape at the end of a stick. The photo is a blurry because Roo was in constant motion—touching the tape, getting her treat, going back to touch the tape. SSD Sandler worked on sits. SSD Freckle worked on the cue “get dressed.” Right now, he’s practicing putting his nose through his harness. When the behavior is finished, he will walk right into his harness until the chest piece touches his chest. This behavior makes it easier for a person to get their dog dressed in their harness themselves. If you live in northeast Pennsylvania and are interested in raising a puppy, we would love to have you join our Northeast group! Please apply online to become a puppy raiser.